I’ve posted before about ambient/drone being the lifeblood of The Commons, and Hammock is in regular rotation. This, from their new album, Mysterium, is just gorgeous. Whenever I get to forgetting that life actually is better than it used to be—or is easier in many ways, at least—I remind myself that we used to live in a studio apartment on the Upper East Side of Manhattan where the floors were so slanted, I once opened the broiler to check on some chicken, and it all slid out onto the floor, piece by piece. I had to keep my feet hooked under my desk or I’d roll away from it and into the foot of the bed, which was just a few inches behind me because the place was so tiny. The fuse boxes in the basement hung from their own wires, and whenever I blew a fuse and had to change it, which happened way more than I would have preferred, I had to kick the basement door in because the super kept padlocking it. The final time I did that, the old man who lived at the top of the basement stairs opened his door to yell at me. “What the hell are you doing?” he said. The old man thought about the situation for a moment. “You’re all right, Mike,” he said, and closed his door. The only outlet in the kitchen was in the landlord halo overhead, so the ‘fridge ran off an extension cord hanging from the ceiling, next to a Punisher action figure that served as a chain pull for the light. And the water pressure was such that if two people in the building forgot to jiggle the handle and left their toilets running when they went to work, the water was dangerously hot and you couldn’t take a shower that day. Funny thing about New York. I never considered myself anything but incredibly lucky to have that apartment because it was cheap. Cody Stark and the good folks at Good Day Sacramento had me on to talk about The Little Drummer Boy Challenge, and a good time was had by all. Click here to watch. 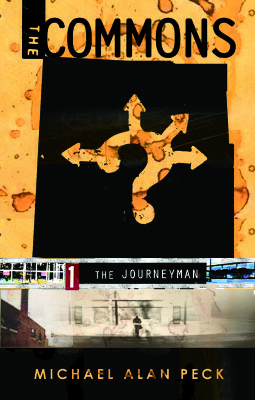 I dedicated The Journeyman to my father, whose imagination, intelligence, and talent were always an inspiration to me. We buried him on Nov. 10. Here’s how we told him goodbye. Thank you to everyone for being here and for giving my father and my family your love and attention. I hereby warn you: this may get long. I’ll begin by pointing out how how appropriate it is that many of us flew to be here. Because while we’re giving my dad over to the earth today, I want to talk about another element that was so integral to his life and who he was. For my father was, first and foremost, of the air. When I was a kid, I remember finding some old coloring books from Dad’s childhood in our basement. On the inside covers and across every blank space, he’d drawn complex aerial battles between vintage fighter planes. And what struck me was that when I drew planes—like every boy did—mine looked like some vague jet-type thing—something that was, at best, identifiable as a plane. Yet even though he’d drawn his as a kid, Dad’s actually looked like real Messerschmitts, Mustangs, and Spitfires. You could identify them. Planes were a thing with him. He grew up building intricate wood and paper models from kits and sent them aloft. Dad couldn’t watch a movie without telling you what kind of airplane you were looking at. And he knew them all. We lived near an air base, growing up, and whenever we’d be outside raking leaves and hear something come tearing overhead, Dad would tell you whether it was a Phantom or a Skyhawk or some other fighter I no longer remember. He was of the air. My father worked on NASA’s Biosatellite 3 project, and he spent many years designing aircraft-carrier launch systems for the Navy. It was because of that work that we have this amazing photo of him, my brother, and me at Cape Kennedy, standing in front of Apollo 11 a month or so before it carried Neil Armstrong, Buzz Aldrin, and Michael Collins to the moon. Dad never flew anything himself, but some time ago, we bought him a glider ride at a place down in Florida. He didn’t get to take it, because every time he tried, the weather decided not to cooperate, the skies clouded over by the time he got there, and they had to cancel. But it doesn’t matter. In my mind, when he’s been in River Garden for the past four years, without his eyesight and moving further and further into a place where he saw things and people that only he could see, he’s been up there whenever he’s wanted to be, looking around and simply marveling. And yet nobody was more grounded and down-to-earth, especially given how just-plain-damn smart he was. He could draw. He invented a couple of things. He was a low-key lord of the Trivial Pursuit board. When he went at a problem, it always involved a pad of graph paper, and it resulted in line after line of arcane formulas and equations using characters I’d never seen before, like Russell Crowe scribbling on a window. He never bragged. He never complained. But if he did a job, you could count on two things: it would take forever, and it would last forever. In our house in Dresher, we had a bannister that had three supports, only two of which were screwed into studs. The middle one was just attached to the drywall, so after years of two knucklehead boys hanging on it, it gave way and punched through the wallboard. Well, Dad did this beautiful wooden support rail and attached the bannister to it, and that thing didn’t give out again. If that house ever burns down or gets carried away by a twister, you’ll see the basement, the chimney, and that bannister hanging in the air because it ain’t going anywhere. He owned not one, but two slide rules—that I knew of; there might have been more. And he could use them. The larger one, in fact, was in a leather case, and it had a loop on it so it could hang on a belt, like a holster. That man could plug you full of hot calculations at 50 paces like a gunslinger. Have Math, Will Travel. Yet he was grounded. As my mother said not long ago, whenever anyone wants to say something isn’t difficult, they say it’s not rocket science. “Well, your father was a rocket scientist,” she told me. “But he never wanted to talk about it because he thought it would just bore people.” When I was at the beach with him one time, I asked him if there was anything he wished he’d done or done more of in his life. And he thought for a moment, and said, “I wish I’d been more of a success.” Because he couldn’t see that he had been. As I said: of the earth. Grounded. Dad was drafted at the end of World War Two and never saw combat, but he helped returning G.I.s who had been in the thick of it, and they told him terrible stories of the things they’d seen and done, exposing him to the worst man was capable of. But he also worked on the space program—and saw humanity at its best. He raised a family. He enjoyed a second shot at life after nearly losing his in college, at Lehigh University, when he was thrown from a car in a terrible accident, spent two weeks in a coma, and wasn’t expected to make it. Renée and I went to a wedding a few years ago and stayed in the Hotel Bethlehem, where my grandmother had checked in decades before, when she came to town to sit with my dad, wondering if he was going to pull through. At that point, certainly, nobody thought that so many years later, his son and daughter-in-law would be having breakfast in the same lobby she’d walked through. But he lived. Boy, did he. Isn’t that a success? He was funny, and he loved people who were funny. He did a very respectable Elmer Fudd. You could count on him to randomly toss out a “Fwee Bwian” or some other Monty Python quote. Or he’d do a Señor Wences routine or a bit from an old Lone Ranger radio episode. He was always game for plopping down on the couch with his sons and their friends to watch cartoons or some terrible Saturday-afternoon movie. It drove my mom crazy, of course, because he was supposed to be adding a third story to the house, or flipping the lawn, or building a new car. But he was there with us instead. One Saturday, we all watched this terrible movie called The Bruce Lee Story, which was supposed to be a biopic about the late kung-fu legend. It starred some guy named Bruce Li who spelled his last name with an “i” instead of a double-”e,” and he looked nothing like the real thing. He was kind of out of shape, and I think he even wore glasses, and we called him Bruce Lie because there was nothing true-to-life about him. I mean, they hadn’t even tried to get a guy who even remotely resembled Bruce Lee. Anyway, in this one scene, he and some other guy are arguing about whose martial art is superior, and they fight, and Bruce Lie humiliates the other man. And the humiliated guy runs back to his home gym, where all these other guys are practicing. And he tries to get them to come beat up Bruce Lie, and they don’t care. They’re not gonna help him until one of them finally asks, “Well, what’d he do?” And the guys says, as if he’s talking about genocide, “He put down Thai boxing.” Now, at that point in the movie, I don’t think they’d even mentioned that they were Thai boxers. But for some reason, that does the trick where nothing else had. Immediately, the gym clears, and all these Thai boxers go looking for Bruce Lie. They find him, and he wipes the floor with all of them, too. The man knew his way around a joke. To get a bit more metaphysical, I remember asking Dad about an Einstein quote I’d read, where Einstein, writing about a friend who’d passed away, said, “[H]e has departed from this strange world a little ahead of me. That signifies nothing. For those of us who believe in physics, the distinction between past, present and future is only a stubbornly persistent illusion.” In other words, his friend wasn’t truly gone. Dad wasn’t familiar with the quote, and I’ve looked up explanations that have been written about it to try and better understand it, and finally I decided to bend it and interpret it the way I wanted to see it. And I did some admittedly strange things. For one, I was always upset that Dad’s eyesight was gone, even though he never let us hear him get emotional about it. As he put it, in his direct way of speaking over the phone one time, “The problem is, I can’t see.” And I considered that to be unfair. He would never see anything new to him again. He would only be able to review what he’d already seen in his mind’s eye. Yet here I was, bike commuting to and from work, six miles each way, riding along this beautiful lakefront in the summer and fall. And so I decided to do something. I never told anyone I was doing it—I never even told my dad I was doing it—but I would ride along and concentrate on the beauty I was seeing. The blue sky on the green lake. The blinding sand. Or the giant autumn moon over the black water in the dark. I’d talk to my dad about these things as I rode, and I’d pretend that he could hear me, that he was looking through my eyes, like a camera. And I pretended that maybe, sitting there and unable to see what was in front of him, he’d suddenly have a picture of what I was looking at pop into his head. Or maybe he’d dream about it that night. I never spoke to him about it, as I said, because I wanted to think that maybe it might happen, even if he didn’t know where it came from. Or maybe, if Einstein was onto something and things exist outside of a linear timeline, it’s happening now. One of the last times I saw Dad, something happened that occurred more than once towards the end. When we were leaving, we’d give him a hug goodbye and walk out of the room, and sometimes he didn’t realize we weren’t there anymore—because, again, he’d lost his eyesight—and you’d hear him say something just as you were almost gone. This one time, I heard him say, still sitting where we’d left him, “It was so short.” And I knew he was talking about our visit, but I couldn’t shake the feeling that he might have meant his life. And I’ll never forget hearing that. Because it is. Life is short. Even when you leave the world at 89. And I must. And we must. Because we should always leave laughing. I’d like to think Dad did. That somewhere he still is—maybe up in that glider, looking around at the wonder of it and just laughing in astonishment at how gorgeous it all is. That’s what I want to leave you with. The picture of my father flying and laughing. We love you, Dad. And we will miss you so very much. So. Here’s to Ira Joel Peck, an original rocket man. A man who touched the sky, even if he himself never flew. A man who loved a bad joke as much as a good one. Who was a success. And who never, ever—not once, ever—put down Thai boxing. Ambient/drone music and Moodstar incense are the fuel of The Commons. When I hear and breathe those things, I know it’s time to get on the word count. Kyle Bobby Dunn is one of my mainstays when writing, and I can’t say enough about his work. Enjoy.